File this under, “Awesome!”: Hot Wheels has fully-embraced the fact that Elon Musk decided to use a Hot Wheels car fastened to the dashboard of his Tesla Roadster he launched into space as part of the SpaceX Falcon Heavy mission last February. So much so, that there are two separate releases of the #’08 Tesla Roadster in the #2019 Hot Wheels mainline to commemorate it. Released as part of the #2019 Hot Wheels “A” case in what was definitely a limited run, the Greetings from Space: ’08 Tesla Roadster came on a special blister card — apart from any series/numbering. Several people suggested that the car should have included the “Starman” who was sitting in the driver’s seat. It seems as though the Hot Wheels team was already working on that idea last year as the #’08 Tesla Roadster with Starman is a completely new casting, as evidenced by its retooled, multi-piece interior AND this release’s toy number (FYD29) on the base. I was fortunate to find one for sale for less than $8-shipped on eBay last week as short-carded, #2019 Hot Wheels “E” case assortment vehicles showed up at Meijer stores in the midwest United States. 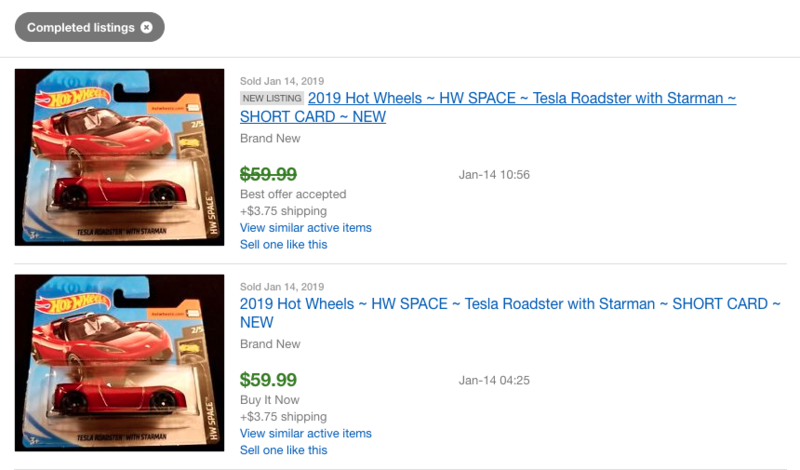 This week, space fever has once again struck the Hot Wheels world — much like after the initial launch of Falcon Heavy — as this short-carded HW Space: #’08 Tesla Roadster with Starman has been selling for as much as $75. Once again, prices will come back to Earth as long-carded 2019 “E” cases haven’t even touched-down in the U.S. yet. With this technically being a new casting, I wasn’t able to identify any variances in the body, however, the base and interior pieces are clearly redesigned. Obviously, the “Starman” was added as part of a separate interior piece in white, but the existing interior piece (black) was also modified as the steering wheel moves to the white piece and the black interior piece now features that original Hot Wheels #Tesla that was mounted to the dash of the real car. Let’s face the fact that the #’08 Tesla Roadster with Starman is going to be consumed by collectors at retail when those 2019 “E” cases do hit. The pure novelty of this release is awesome, as its one that I’m sure most collectors will want in their collection. With prices in the double digits — currently selling for $60 a piece — profiteers will be flocking to the stores upon first notice of big box retail getting this case code in. As part of the #2019 Hot Wheels #HW Space series, this release shouldn’t be any more limited than any of the other cars in this series so… BE PATIENT and Happy Hunting! RELEASE DETAILS: Metalflake Dark Red Body (metal). Clear Windshield. Black Interior. White Starman piece. Black RA6 Wheels. Black Base (plastic). Made in Malaysia. Toy# FYD29. Released in 2019 as #2 of 5 in the HW Space series (#109/250 in the 2019 mainline). Take a stroll through my ’69 & ’70 Dodge Charger Collection! The Tesla cars are the reason I got into collecting and I really like what they have been coming out with lately. Great article! Love the concept but the casting seems rougher than the original and the paint looks like that of a 70’s casting.